Students wishing to pursue the Bachelor of Science in Nursing degree (BSN) from the University of Saskatchewan can take the entire degree at Parkland College in Yorkton, SK. The BSN is a four-year non direct-entry program, consisting of a pre-professional year (Year 1) of prerequisite university-level courses, followed by three years of concentrated nursing education and clinical practice opportunities. Students will develop critical thinking skills and prepare to write the national licensure examination to become a Registered Nurse (RN). Students begin by applying to the College of Arts & Sciences to take a pre-professional first year. This first year is foundational to the nursing program and will include courses in the humanities, natural, social and health sciences. During the pre-professional year students apply to the College of Nursing to be accepted to enter Year 2 of the degree program. The application deadline is March 31 of each year. Acceptance is based on successful completion of the courses in the pre-professional year and admission is competitive. Upon acceptance to the BSN program students will then be able to complete the rest of the degree at Parkland College and most clinical components in the Sunrise Health Region. Learn where you live! Complete your degree and clinical component close to home. Many students are drawn to our unique learning environment where class sizes are typically smaller. On average university students at Parkland College score 10% higher than those in a larger on-campus program. Please note: Classes are subject to change. How do I take classes from the University of Saskatchewan or University of Regina at Parkland College? 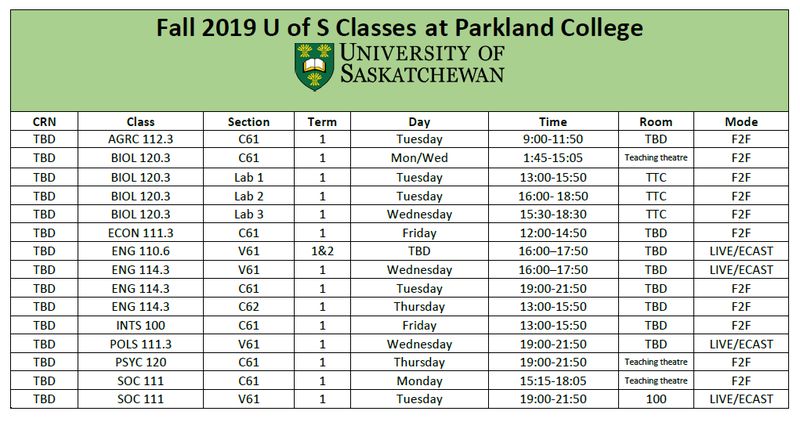 You can take university classes at Parkland College if you have been accepted for admission to either the University of Regina or the University of Saskatchewan. Go to the Admissions Page more for detailed information on how to apply. Is there an application to take classes at Parkland College? You don’t have to fill in a separate application to take classes at Parkland College, you just have to be accepted to either University of Saskatchewan or University of Regina. When you register for classes you register in the sections of the class being held in Yorkton (or your community of choice for televised classes). I am a University of Regina student but I want to take Psychology which is a University of Saskatchewan class? It is easy to take a class from the “other university” talk to our academic advisor and she will help you fill in a Common Visiting Student Form. This form lets you take classes from the “other university” without having to apply for admission; the form is also a way to have the transfer credit approved at you home university before you take the class. If you are a University of Saskatchewan student you just have to fill in the form, after we send it away you don’t have to do anything else. If you are a University of Regina student you have to wait until you get a letter from the University of Saskatchewan giving you permission to go online to the University of Saskatchewan website PAWS to register in the class yourself. It is an easy process, almost every student at Parkland College takes a class from the other university. You can pay your fees in many different ways; the important thing to note is that you have to pay your fees to the University that offers the class, so you pay the University of Saskatchewan for their classes and the University of Regina for their classes. To find out how much you owe go to either PAWS for University of Saskatchewan or URSelfService for University of Regina and look for the Account Summary by term. On these sites there is also information about how you can pay. You can pay in a number of different ways, online, at an ABM, at certain bank branches, by cheque or even in cash. Failure to pay in a timely manner may incur late fees and will prevent you from registering in next terms classes and stop you from seeing you final mark for your classes. Where do I get my textbooks? You can buy textbooks from the bookstore of the university from which the class originates. Both have online shopping for textbooks. The University of Regina bookstore is here and the University of Saskatchewan bookstore is here. Both university bookstores charge for shipping. You do not have to buy new textbooks, the university bookstores also sell used textbooks. You can also buy textbooks from Amazon and Chapters online or Coles in Parkland Mall, both of the online booksellers sell used textbooks too. In some cases shipping may be free. Sometimes students will post notices in the student coffee room with textbooks for sale, these can be the best deal but check with the official list at the university bookstore to make sure that the prof hasn’t chosen a newer edition or changed the required texts for the course. How do I know that I am registered in the right class? 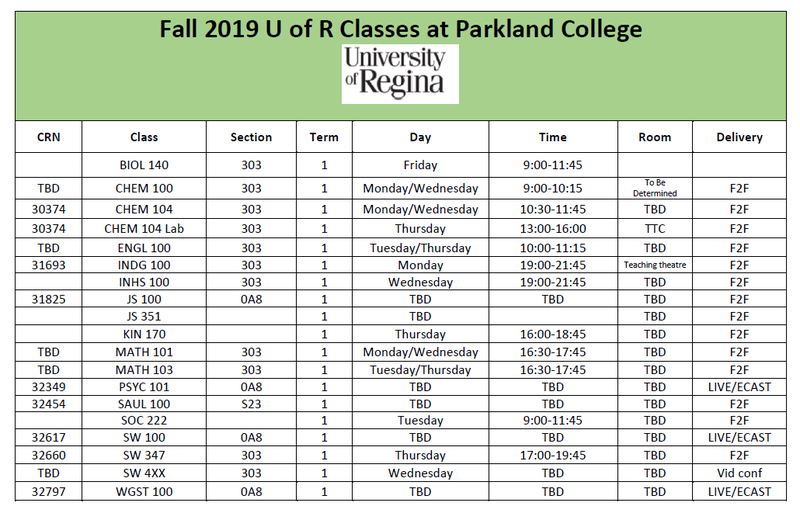 You can check online at URSelfService or PAWS to see which classes you are registered in, then check the Course Registration Numbers (CRNs) in the University bulletin, these are the sections being offered at Parkland College. I want to change my major, what do I do now? Lots of people change their mind about what they want to major in at university, just make an appointment to see the academic advisor and she will help you find the right direction to match your career goals. How do I transfer to Saskatoon or Regina? You don’t have to do anything when you decide to go to the main campus to take classes. 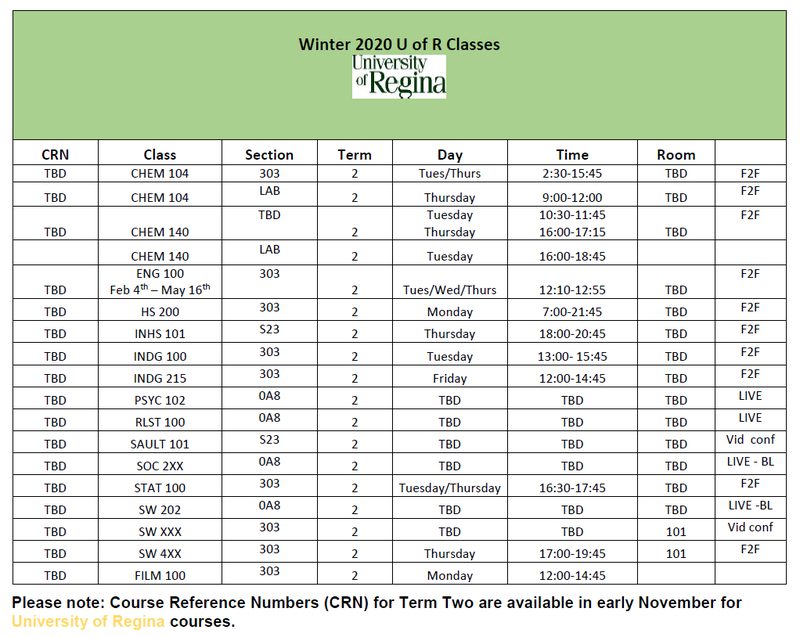 When you register for classes for the next term you just register for the classes located in Saskatoon or Regina. When you take classes at Parkland College you are a University of Regina or University of Saskatchewan student, there is no transfer process between here and the main campus. Are there real instructors at Parkland College? Parkland College has four types of classes, face to face, multi-mode, televised and online. Most of the first year classes and social work classes are face to face with a live instructor in the room teaching you. The instructor is selected and hired by the university and is paid by the university. They have to meet the same standard the instructors on campus would have to meet. In almost every case the instructor has a minimum of a master’s degree in the subject that they are teaching, many have doctoral degrees. Some of our instructors live locally, others drive from considerable distances to teach at Parkland College. Face to face classes are currently only available in Yorkton. Multi-mode classes are increasing in number, here the instructor is live in Saskatoon or Regina and video conferencing equipment enables you to see the instructor and the other students taking the class in up to four other locations in the province projected onto a big screen. The instructor can see you too, and all of the other students around the province. Multi-mode classes are only available in Yorkton right now. Televised classes are taught by instructors located in Regina or Saskatoon, they usually have a class in the room with them, the class is broadcast via the cast.scn satellite network to many locations in Saskatchewan. You watch the class on either projected onto a big screen or on a television screen, you can call into the studio with questions and to participate in class discussions. Televised classes are available at all Parkland College locations you must be at a college location to view these classes. Online classes are classes that are available on any computer with an internet connection. Most online classes have a start and end date that is the same as the other classes but do not have regular meeting times. The classes are usually set up as a series of modules with a different module to be completed each week. You can complete the work for each class at any time during the week. Final exams may be online or you may have to come to a college location to write the exam. Are the classes easier at Parkland College? Classes at Parkland College are no easier or harder than they are on the main campus. Instructors are approved by the department and they must meet the same requirements as on campus instructors. In some cases students write the same exams as on campus students. However, because of the smaller class sizes and more personalized service at Parkland we have found that students tend to get better marks than their peers who went straight to the main campus. Can I still apply to Nursing/Pharmacy/Nutrition/Social Work if I do my first year at Parkland College? Yes, you can apply for professional programs while you are taking classes at Parkland College. If you need help contact our academic advisor, she will be able to help you with your application by making sure you have all of the prerequisites and that you meet the deadlines. Are the fees lower at Parkland College? Tuition fees for university classes at Parkland College are the same as the fees on campus. You will pay a lower rate for student fees and you won’t have to pay the athletic fee or the bus pass (U of S). You will not be charged the medical and dental insurance fee either, however, if you would like, you can opt in to the medical and dental plan for students, this is a great deal if you don’t have coverage elsewhere. Check with the academic advisor for more information. Can I apply for Parkland College scholarships and my university scholarships? Yes you can apply for entrance scholarships from Parkland College and add them to any other scholarships you may receive from any source. The deadline for entrance scholarships is usually in May before the new academic year, awards are made at the end of September. In addition, students who are taking classes from Parkland College can also apply for the internal scholarships that are awarded in February/March. Some students receive up to $3000 from Parkland College in scholarships alone. Can I start at Parkland College and move to university in another province? If you are planning to take your first year at Parkland College and then move out of province you still need to be accepted by either the university of Saskatchewan or University of Regina. You will need to work closely with our academic advisor to make sure that all of your classes from your time at Parkland will transfer to your new university and that you take the classes that the out of province university requires so that you are not delayed by missed classes. We have had many students transfer to U of A, U of C, UBC and Brandon University. Our advisor will work with you and the university you would like to go to so that you only take what you need and what will transfer. Can I start classes at Parkland College in January? Yes, you can start classes at several different times each year, in September, January, May and sometimes June, July and August. You will need to make sure that you apply in plenty of time and that you select your classes with our academic advisor at least a few weeks before classes start. Please don’t leave it to the last minute. Most graduates of the College of Nursing become head nurses, nursing supervisors, graduate nurses and registered nurses who provide and/or co-ordinate patient care in hospitals, nursing homes, clinics, nursing agencies, rehabilitation centres and extended-care facilities. During your first year of pre-nursing studies at Parkland College you will take a wide range of classes in a number of different subject areas called the core requirements or distribution requirements. They allow you to try out different types of classes and help you to get a broader understanding of learning at the university level. 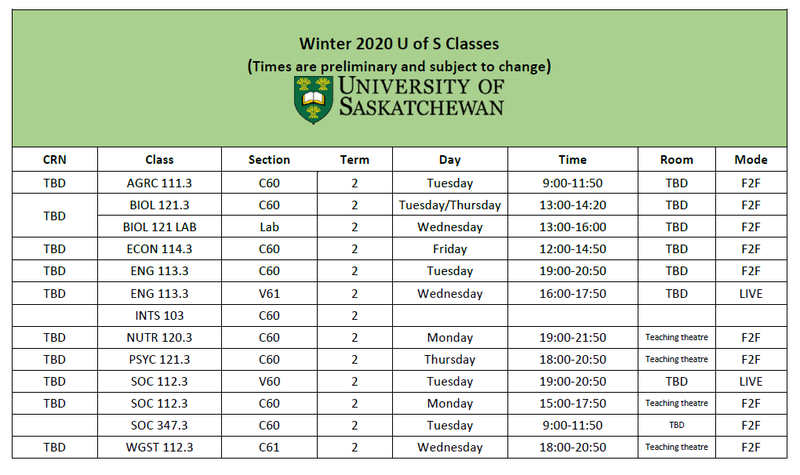 You will need to be accepted into the College of Arts & Science with your major listed as “undeclared” at the University of Saskatchewan to take your pre-professional year at Parkland College. During your first year of pre-professional studies you will apply to the College of Nursing to become a BSN degree student. Application deadline is March 31st of each year. For further information on pre-requisites please click here. It is essential that all students consult a counsellor once you have your acceptance letter from the U of R or U of S to develop a schedule of classes.